Ironically, the ring on the neck of the Ring-necked Duck is not visible in the field. A much better field mark it the ring on the bill. This diving duck is found in Tennessee during the non-breeding season and more likely to be seen on small ponds than other diving ducks. During the winter they can form large rafts* and are often found in association with Lesser Scaup. This duck breeds across central Canada reaching the northern United States. It spends the winter across the southern United States, along both coasts, and southward through Mexico, Central America, and the Caribbean. Description: This medium-sized diving duck has a distinctive white ring on the bluish, black-tipped bill. A short crest gives the head a peaked look. The male has a black head, chest, back and rear end. The sides are gray and there is a vertical white stripe on the shoulder. The female is overall brown with a white eye-ring that has a white line extending back from the eye. Male Greater and Lesser Scaup have light backs and lack the ring around the bill. Female Greater and Lesser Scaup have a white patch at the base of the bill and lack an eye-ring. Female Redheads have a rounded head, a paler back, and no eye-ring. 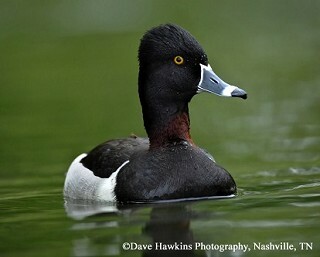 Habitat: In Tennessee, Ring-necked Ducks are found on lakes, ponds, flooded grain fields and forested wetlands. They are found in more shallow portions of lakes than other diving ducks. Diet: Aquatic plant seeds and tubers, also aquatic invertebrates. Status in Tennessee: The Ring-necked Duck is a fairly common migrant and winter resident in the state, with greater numbers wintering in West and Middle Tennessee. They arrive in early October and most depart by late April. The chestnut-colored ring around the neck, giving this duck its name, is only visible when the bird is in the hand. Such subtle characters would have been obvious to the people first describing this species from a dead specimen. The oldest known Ring-necked Duck in the wild was 20 years, 5 months old. Best places to see in Tennessee: Cross Creeks NWR, and other state and federal waterfowl refuges in Tennessee. Hohman, W. L., and R. T. Eberhardt. 1998. Ring-necked Duck (Aythya collaris). The Birds of North America, No. 329 (A. Poole and F. Gill, eds.). The Birds of North America, Inc., Philadelphia, PA.
*A raft is the name given to a large number of ducks on the water.